An astute reader might have noticed a little something extra in the background of the picture of a Bois d’Arc that I posted yesterday. 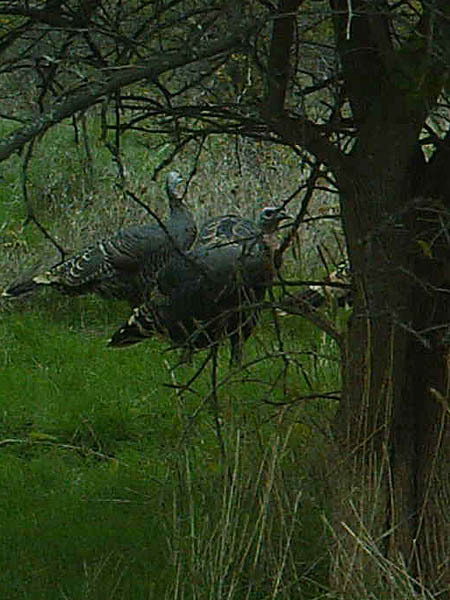 Do you see the Wild Turkeys next to the tree on the left-hand side of the photograph? 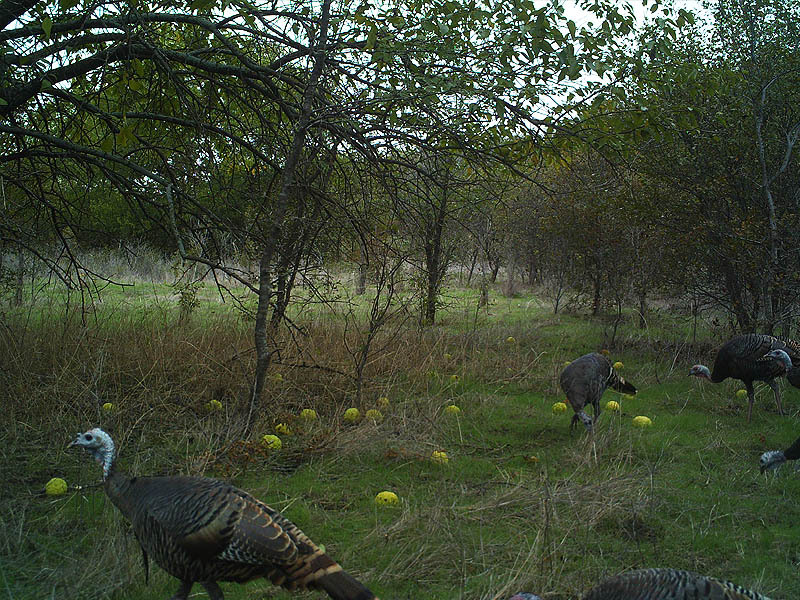 So, does this mean that Wild Turkeys eat Osage Oranges? Well, let’s see. 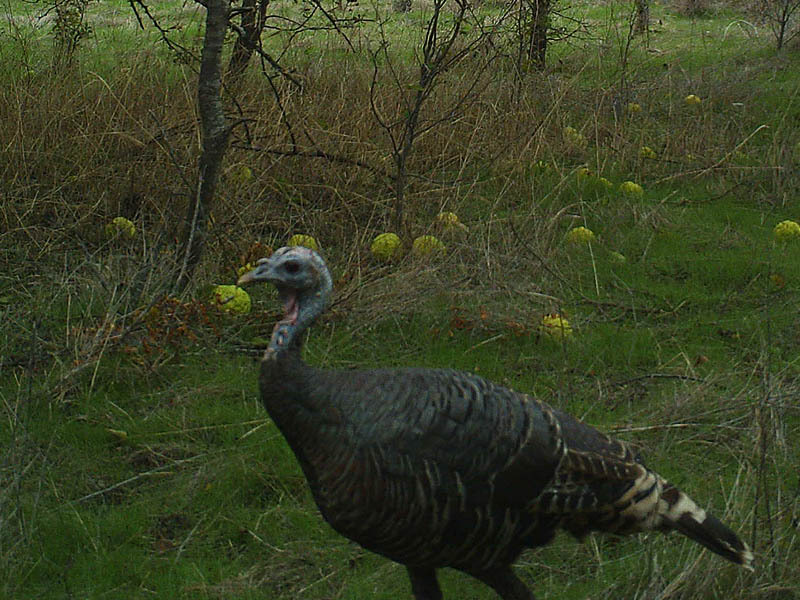 Like I mentioned yesterday, I setup a trail camera to monitor a second Bois d’Arc tree just a little over a mile to the east of this one. 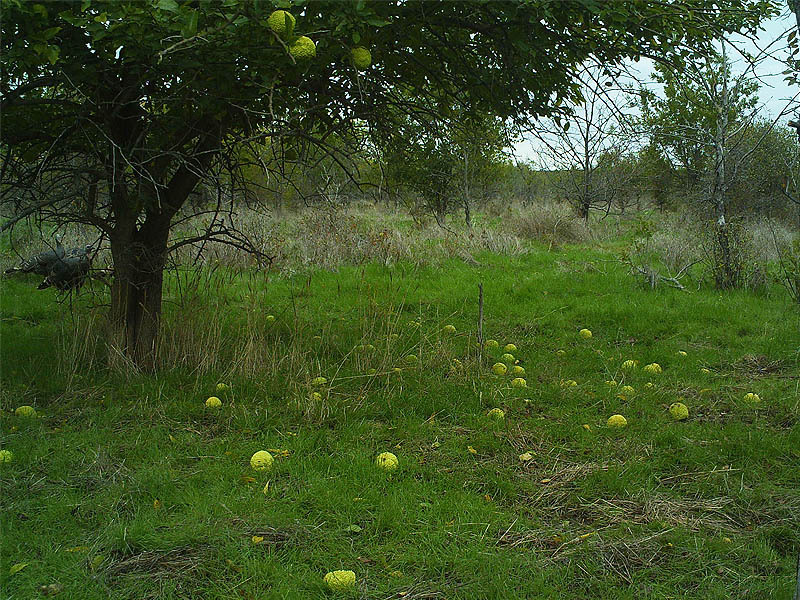 At the time the ground was absolutely littered with horse apples. 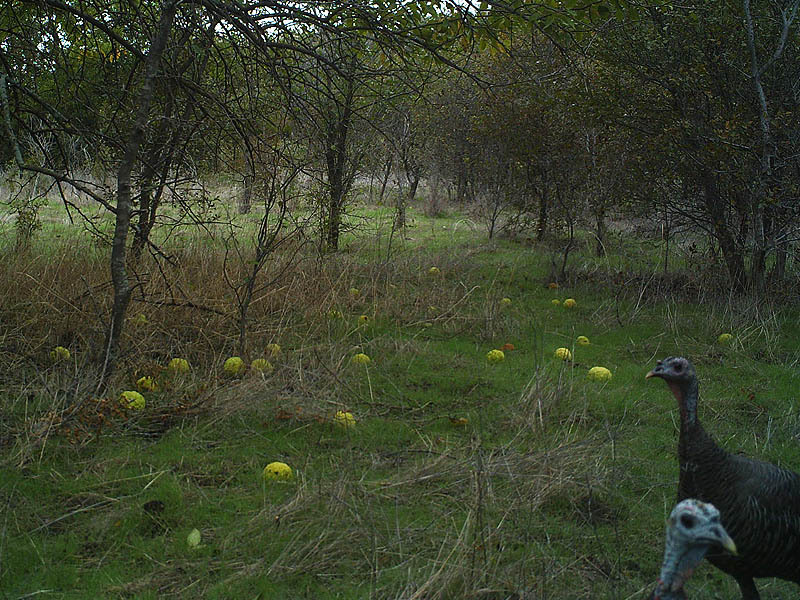 But, by the time the site is visited by a rafter of Wild Turkey, most of the Osage Oranges were gone. 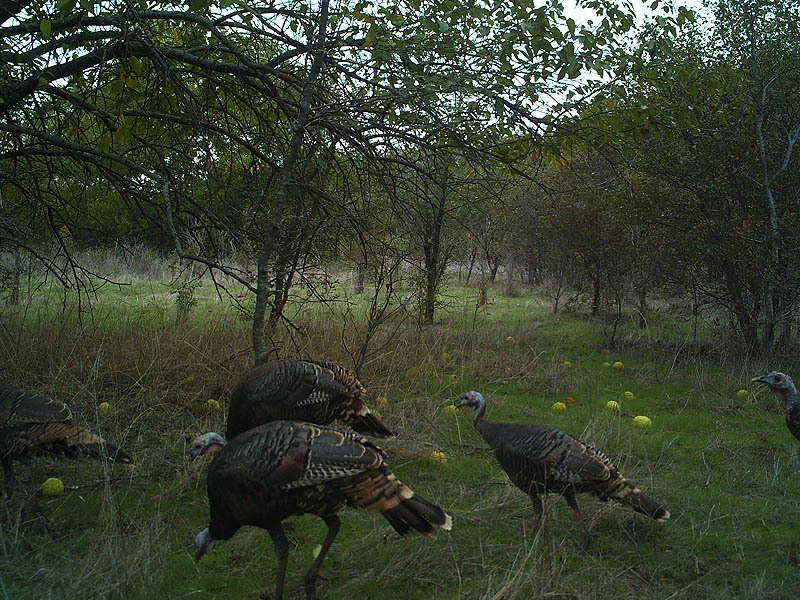 Something had definitely been eating them, but was it the turkeys? Well, no. 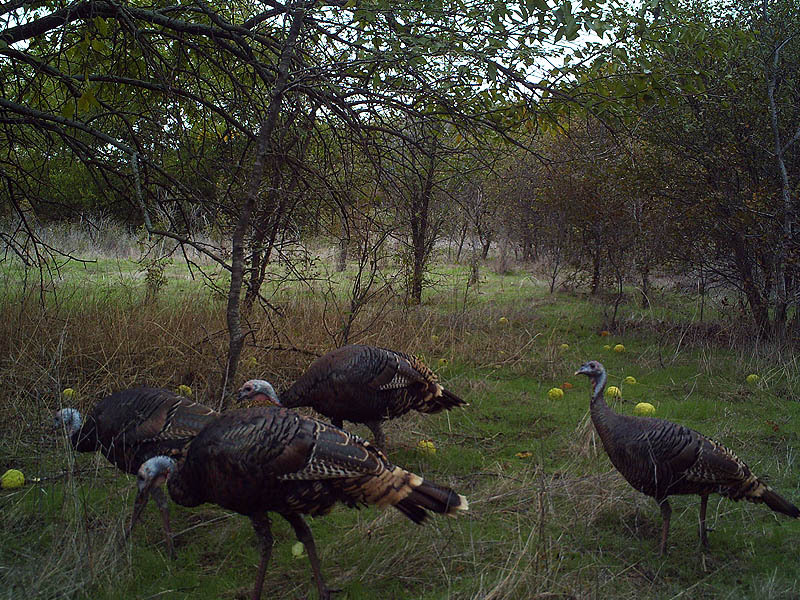 The turkeys peck and probe as they make their way across the camera’s field of view, but they are never seen eating the fruit. 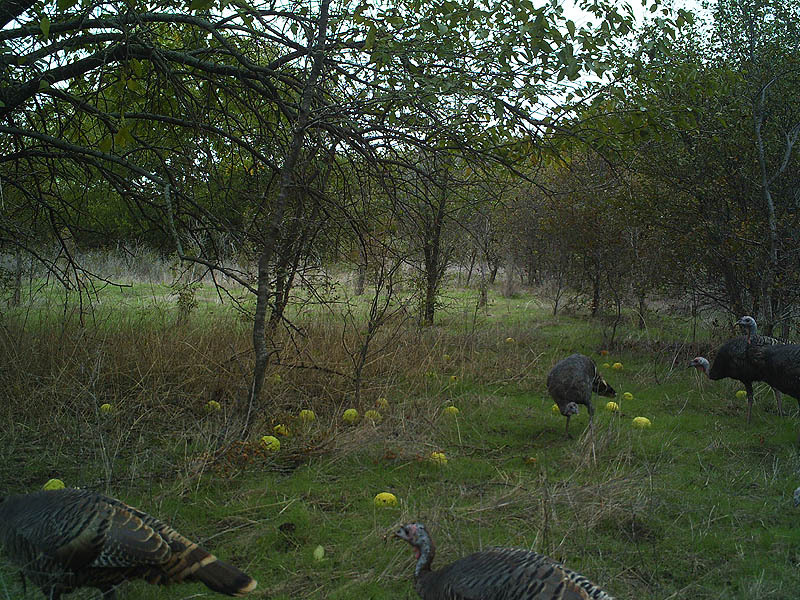 The Wild Turkeys were not here to feed on the horse apples, they were only passing through. 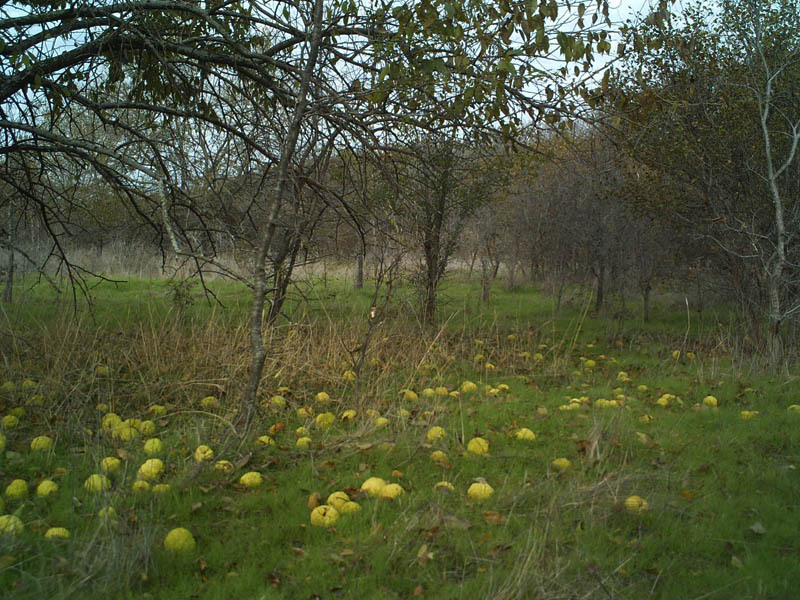 Next Next post: White-tailed Deer – Osage Orange Eaters? Hi Chris, We know that squirrels eat the fruit. It doesn’t seem like a squirrel would be big enough to carry the fruit away, but they do pack things from place to place. I have seen remains of a partially eaten fruit on top of a stump some distance from a Bois d’arc tree many times. The remains always looked similar to what I see when a squirrel cuts up an Osage orange fruit. Just my speculation, but I also think that paleontologists and ecologists may be straining for an explanation for the large size of the fruit when they invoke things like _Gomphotherus_ . I wonder, why not squirrels as movers and planters of the seed? Occam’s razor and all. Well, David, my impression is that the squirrels are only after the seeds. It looks to me as if they simply peel away the meat on the way to the seeds, but that they do not eat it. If that’s right, I think it is interesting that they somehow know that there are edible seeds inside that milky latex filled fruit. The seeds must taste really good for the squirrels to go to all that effort! I think I have also read that Fox Squirrels are not native to the crosstimbers region, but that they were introduced there by people. Again, I am not sure of my facts, but if this is right then there may have been no squirrels inside the Bois d’Arcs original natural range, which was also just a narrow strip through north central Texas. Anyhow, I plan on doing the big reveal tomorrow. Maybe you will be surprised by what IS eating the fruit! 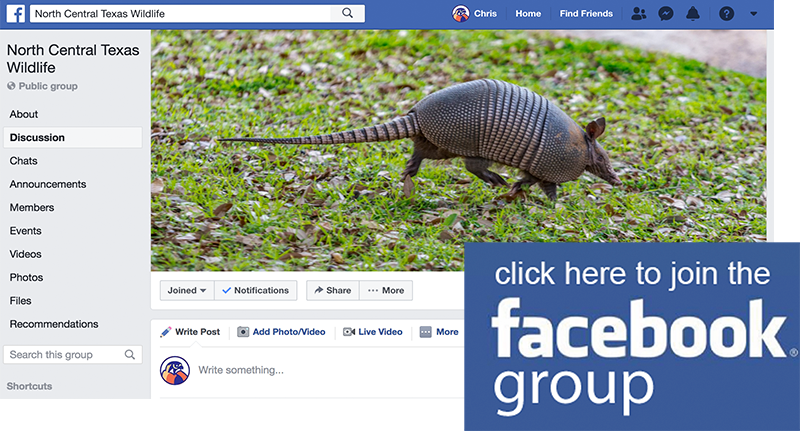 Chris, Davis and Schmidly (_Mammals of Texas, Online Edition: http://www.nsrl.ttu.edu/tmot1/sciunige.htm ) say that the fox squirrel is native to the “eastern two thirds of Texas.” That would include the Cross Timbers. This squirrel has been widely introduced though, and has expanded its range by inadvertent hitchhiking on vehicles and trains. 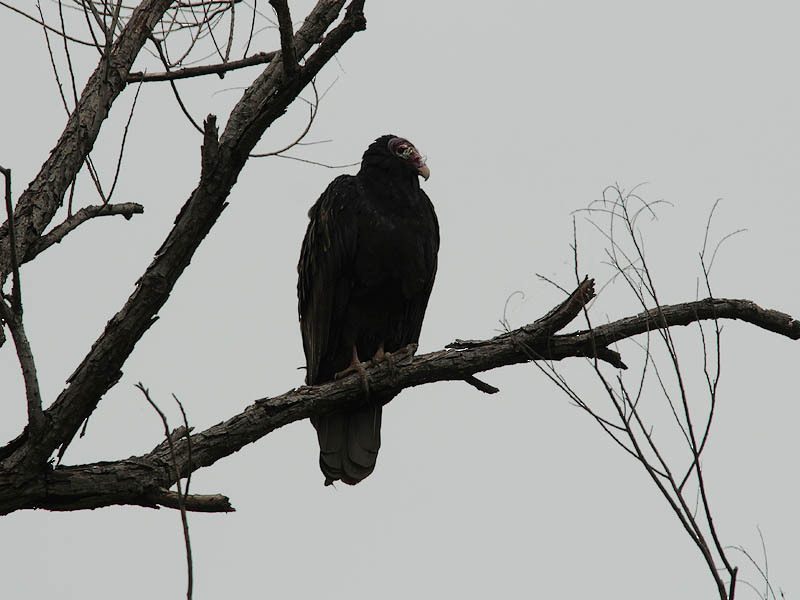 I see them regularly when I visit my aunt in Monahans, Texas way out in the deserts of western Texas. It would seem odd to me that they would not occur naturally in the Cross Timbers, which produces prodigious quantities of acorns and hickory nuts. 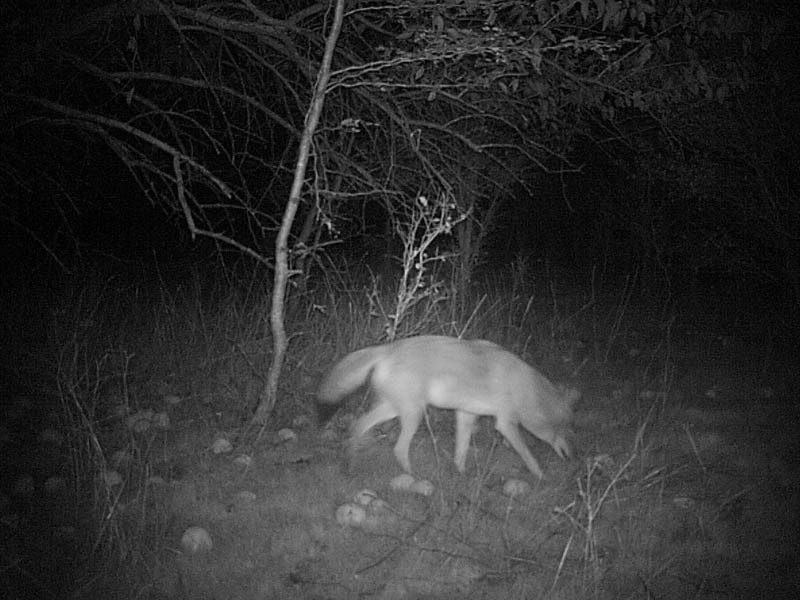 Davis and Schmidly also point out that the squirrel was present along river corridors far west of its upland range. 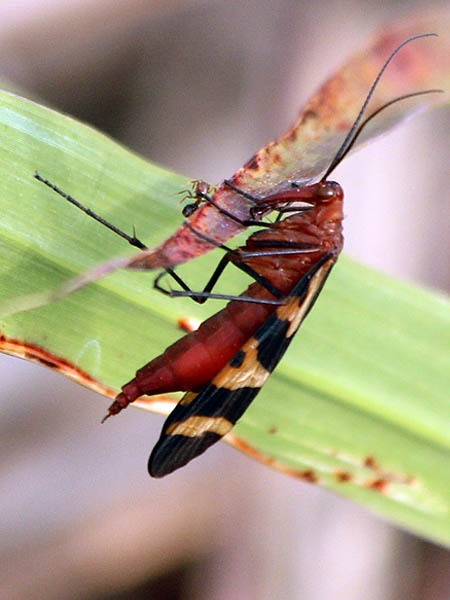 The entry is flagged with a red exclamation mark and if you mouse over it you get a message that says “Introduced in Denton County, TX, US: arrived in the region via anthropogenic means” I’m not sure why iNaturalist believe that is true, but I would be more inclined to agree with your view of the situation. Chris, I am surprised, and I really appreciate your efforts to learn and document this. I have heard enough speculation from scholarly sources to wonder if this bit of natural history is previously undocumented. A thorough literature search would reveal that of course. If not, your data should be reported in the scholarly literature. _Southwestern Naturalist_ would be an appropriate venue for a note on this, with photographs. Of course, it would have to be cast in the style required by the journal and described in its “Instructions to Authors,” available online. But, it may be known in the literature already. I agree that the squirrels mainly eat the seeds. 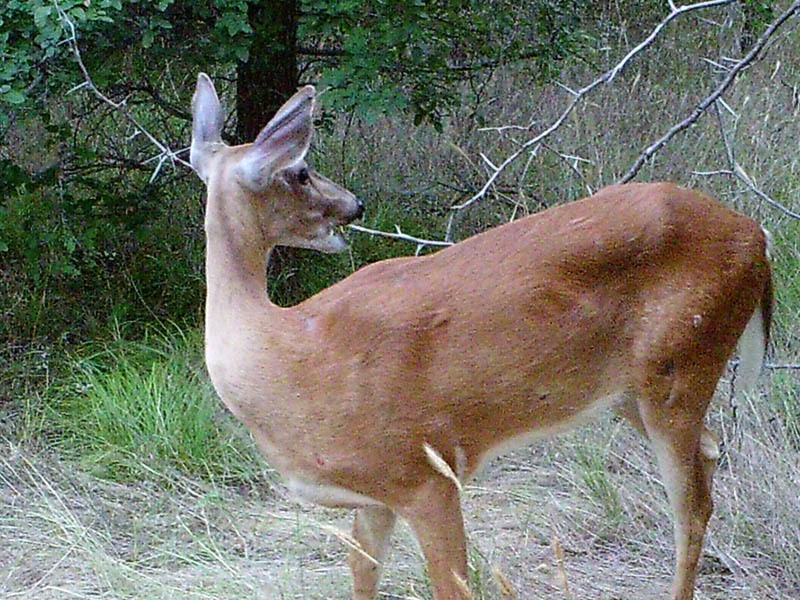 The photo you have of the deer licking but not eating a fruit, and then later the animals consuming them suggests that their is a chemical cue to the stage of ripeness that the deer prefer. Maybe like persimmons, only palatable after a frost (or like a pear, only after aging to a proper stage). My rural land, which is being held as a nature preserve, is called Osage Moon. It’s in Fannin County which is where osages originated. We even have a museum! When insurance required the pier and beam house foundations use osage wood, which is almost as hard as concrete and more durable, folks leveled all the osages along the creeks. We are trying to build them back up. We notice that in dry autumns while the fruit is still green that animals will nibble them for water. We “bowl” every fall by filling the UTV bin with osages and distribute them, which has been semi-successful at increasing their range. Amy, I had a look at your property via the Google Map link you shared with me. Looks like a beautiful place! Chris, with reference to the pre Columbian range of _Maclura pomifera_, my understanding is that paleotological data show that it formerly was widespread in N.A., but became restricted to a strip in SE Oklahoma and through east and north central Texas to near the center of the state by the time of European settlement. Then the usefulness (and weediness) of the tree resulted in its quick spread across the continent. There does seem to be some data that suggest that the range was increased by Native Americans due to their use of the wood. Here is the Wikipedia article, which agrees with most of what I have read elsewhere. 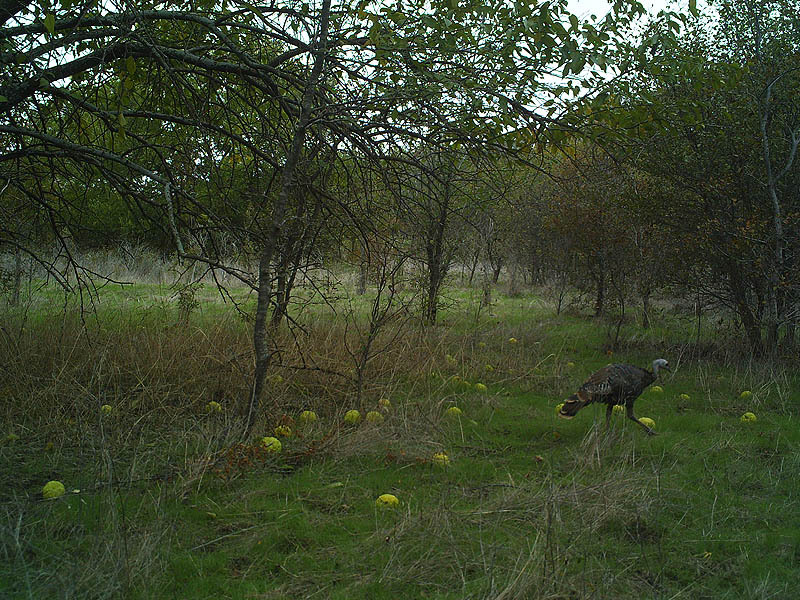 Hey, if you don’t mind me asking what part of Lake Lewisville did you set theses trails cams out on?